Minghua Chen received his B.Eng. and M.S. degrees from the Dept. of EE at Tsinghua University in 1999 and 2001, respectively. He received his Ph.D. degree from the Dept. of EECS at UC Berkeley in 2006. He spent one year visiting Microsoft Research Redmond as a Postdoc Researcher. He joined the Dept. of Information Engineering, the Chinese University of Hong Kong in 2007 as an Assistant Professor. He is also an Adjunct Associate Professor in Peking University Shenzhen Graduate School in 2011-2014. 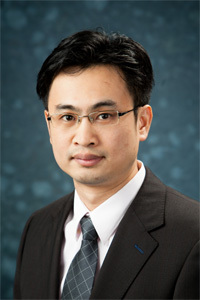 He received the Eli Jury Doctoral Thesis award from UC Berkeley in 2007, the ICME Best Paper Award in 2009, the IEEE Trans. on Multimedia Best Paper Award in 2009, and the ACM Multimedia Best Paper Award in 2012. His current research interests include smart (micro) grids, energy-efficient data centers, distributed and stochastic network optimization and control, multimedia networking, p2p networking, wireless networking, multi-level trust data privacy, network coding and secure network communications. Minghua Chen and Mung Chiang, "Distributed Optimization in Networking: Recent Advances in Combinatorial and Robust Formulations", book chapter in Modeling and Optimization: Theory and Applications 2010, Springer Proceedings in Mathematics, 2012. Y. Li, H. Yao, M. Chen, S. Jaggi, and A. Rosen, "RIPPLE Authentication for Network Coding", accepted for publication (Dec. 2012) in IEEE/ACM Trans. on Networking. X. Chen, M. Chen, B. Li, Y. Zhao, Y. Wu, and J. Li, "Celerity: A Low Delay Multiparty Conferencing Solution", accepted for publication (Sept. 2012) in IEEE Journal on Selected Areas in Communications (JSAC) – 2012 Special Issue on Emerging Technologies in Communications. T. Lu, M. Chen, and L. Andrew, "Simple and Effective Dynamic Provisioning for Power-Proportional Data Centers", accepted for publication (July 2012) in IEEE Trans. on Parallel and Distributed Systems, Special Issue on Cloud Computing. M. Chen, S. Liew, Z. Shao, and C. Kai, "Markov Approximation for Combinatorial Network Optimization", accepted for publication (Oct. 2012) in IEEE Trans. on Information Theory. C. Huang, M. Chen, and J. Li, "Pyramid Codes: Flexible Schemes to Trade Space for Access Efficiency in Reliable Data Storage Systems", accepted for publication (Nov. 2012) in ACM Trans. on Storage. A. Abate, M. Chen, Y. Wang, A. Zakhor, and S. Sastry, "Design and Analysis of New Flow Control Schemes over Wireless Networks", in International Journal of Robust and Nonlinear Control, 2011. Y. Li, M. Chen, Q. Li, and W. Zhang, "Enabling Multi-level Trust in Privacy Preserving Data Mining", IEEE Trans. on Knowledge and Data Engineering, Sept., 2012. M. Chen, M. Ponec, S. Sengupta, J. Li, and P. A. Chou, "Utility Maximization in Peer-to-Peer Systems with Applications to Video Conferencing", IEEE/ACM Trans. on Networking, June, 2012. H. Yao, S. Jaggi, and M. Chen, "Passive network tomography for erroneous networks: A network coding approach", IEEE Trans. on Information Theory, Oct. 2011. M. Ponec, S. Sengupta, M. Chen, J. Li, and P. A. Chou, "Optimizing Multi-rate Peer-to-Peer Video Conferencing Applications", IEEE Trans. on Multimedia, special issue on Iterative Multimedia, Oct. 2011. Z. Shao, M. Chen, A. S. Avestimehr, and S. Li, "Cross-layer Optimization for Wireless Networks with Deterministic Channel Models", IEEE Trans. on Information Theory, Sept. 2011. S. Sengupta, S. Liu, M. Chen, M. Chiang, J. Li, and P. A. Chou, "Peer-to-Peer Streaming Capacity", IEEE Trans. on Information Theory, August 2011. C. Chau, M. Chen, and S. Liew, "Capacity of Large Scale CSMA Wireless Networks", IEEE/ACM Trans. on Networking, June 2011. L. Lu, J. Tu, C. Chau, M. Chen, Z. Xu, and X. Lin, "Towards Real-Time Energy Scheduling in Microgrids with Performance Guarantee", in Proceedings of IEEE Power and Energy Society General Meeting, Vancouver, BC, Canada, 2013. J. Ye, H. Cheng, Z. Zhu, and M. Chen, "Predicting Positive and Negative Links in Signed Social Networks by Transfer Learning", in Proceedings of the 22nd International World Wide Web Conference (WWW 2013), Rio de Janeiro, Brazil, 2013. Z. Shao, X. Jin, W. Jiang, M. Chen, and M. Chiang, "Intra-Data-Center Traffic Engineering with Ensemble Routing", in Proceedings of IEEE INFOCOM, Torino, Italy, Apr. 14 - 19, 2013. L. Zhang, C. Wu, Z. Li, C. Guo, M. Chen, and F. Lau, "Move Big Data to the Cloud", in Proceedings of IEEE INFOCOM (mini-conference), Torino, Italy, Apr. 14 - 19, 2013. S. Mehrotra, H. Chen, S. Jain, J. Li, B. Li, and M. Chen, "Bandwidth Management for Mobile Media Delivery", in Proceedings of IEEE Global Communications Conference (GLOBECOM 2012), Anaheim, California, USA, December 3 - 7, 2012. M. Bakshi, S. Jaggi, S. Cai, and M. Chen, "SHO-FA: Robust compressive sensing with order-optimal complexity, measurements, and bits", in Proceedings of the 50th Annual Allerton Conference on Communication, Control, and Computing (Allerton 2012), Urbana, Illinois, USA, October 1 - 5, 2012. S. Agnihotri, S. Jaggi, and M. Chen, "Analog Network Coding in General SNR Regime: Performance of Network Simplification", in Proceedings of IEEE Information Theory Workshop 2012, Lausanne, Switzerland, September 3 - 7, 2012. K. Lam, C. Chau, M. Chen, and S. Liew, "Mixing Time and Temporal Starvation of General CSMA Networks with Multiple Frequency Agility", in Proceedings of 2012 IEEE International Symposium on Information Theory (ISIT 2012), Cambridge, MA, USA, July 1 - 6, 2012. S. Agnihotri, S. Jaggi, and M. Chen, "Analog Network Coding in General SNR Regime", in Proceedings of 2012 IEEE International Symposium on Information Theory (ISIT 2012), Cambridge, MA, USA, July 1 - 6, 2012. S. Agnihotri, S. Jaggi, and M. Chen, "Analog Network Coding in General SNR Regime: Performance of A Greedy Scheme", in Proceedings of International Symposium on Network Coding 2012 (NetCod 2012), Cambridge, MA, USA, June 29 - 30, 2012. C. Chau, J. Zhang, M. Chen, and S. Liew, "Interference-safe CSMA Networks by Local Aggregate Interference Power Measurement", in Proceedings of the 10th International Symposium of Modeling and Optimization of Mobile, Ad Hoc, and Wireless Networks (WiOpt 2012), Paderborn, Germany, May 14 - 18, 2012. T. Lu and M. Chen, "Simple and Effective Dynamic Provisioning for Power-Proportional Data Centers", (invited), in Proceedings of the 46th Annual Conference on Information Sciences and Systems (CISS), Princeton, NJ, US, March 21 - 23, 2012. Z. Shao, H. Zhang, M. Chen, and K. Ramchandran, "Reverse-Engineering BitTorrent: A Markov Approximation Perspective", in Proceedings of IEEE INFOCOM (mini-conference), Orlando, Florida, USA, Mar. 25 - 30, 2012. W. Jiang, T. Lan, S. Ha, M. Chen, and M. Chiang, "Joint VM Placement and Routing for Data Center Traffic Engineering", in Proceedings of IEEE INFOCOM (mini-conference), Orlando, Florida, USA, Mar. 25 - 30, 2012. F. Wang, J. Liu, and M. Chen, "CALMS: Migration towards Cloud-Assisted Live Media Streaming", in Proceedings of IEEE INFOCOM, Orlando, Florida, USA, Mar. 25 - 30, 2012. X. Chen, M. Chen, B. Li, Y. Zhao, Y. Wu, and J. Li, "Celerity: A Low Delay Multiparty Conferencing Solution", in Proceedings of ACM Multimedia 2011, Scottsdale, Arizona, USA, Nov. 28 - Dec. 1, 2011. S. Agnihotri, S. Jaggi, and M. Chen, "Amplify-and-Forward in Wireless Relay Networks", Proceedings of IEEE Information Theory Workshop 2011, Paraty, Brazil, Oct. 16-20, 2011. Z. Shao, M. Chen, and S. Li, "Distributed Optimization for Combinatorial Coding Subgraph Selection Problems", in Proceedings of the 2011 International Symposium on Network Coding (NetCod 2011), Beijing, China, July 25-27, 2011. M. Johnson, M. Chen, and K. Ramchandran, "On the Role of Network Coding in Uncoordinated Multihop Content Distribution over Ad Hoc Networks", in Proceedings of the 2011 International Symposium on Network Coding (NetCod 2011), Beijing, China, July 25-27, 2011. W. Chen, Y. Wang, M. Chen, and S. Liew, "On the Performance of TCP over Throughput-Optimal CSMA", in Proceedings of the 18th ACM/IEEE International Workshop on Quality of Service (IWQoS 2011), San Jose, CA, US, June 6-7, 2011. X. Chen, M. Chen, B. Li, Y. Zhao, Y. Wu, and J. Li, "Celerity: Towards Low Delay Multiparty Conferencing over Arbitrary Network Topologies", in Proceedings of the 21th International Workshop on Network and Operating Systems Support for Digital Audio and Video (ACM NOSSDAV 2011), Vancouver, Canada, June 2-3, 2011. H. Yao, S. Jaggi, M. Chen, and T. Ho, "Network reed-solomon codes: Efficient byzantine adversary localization", (invited), in Proceedings of the 44th Annual Asilomar Conference on Signals, Systems, and Computers, Pacific Grove, CA, US, November 7-10, 2010. S. Zhang, Z. Shao, and M. Chen, "Optimal Distributed P2P Streaming under Node Degree Bounds", in Proceedings of the 18th IEEE International Conference on Network Protocols (ICNP 2010), Kyoto, Japan, Oct. 5 - 8, 2010. S. Liu, M. Chen, S. Sengupta, M. Chiang, J. Li, and P. A. Chou, "Peer-to-Peer Streaming Capacity under Node Degree Bound", Proceedings of the 30th International Conference on Distributed Computing Systems (ICDCS 2010), Genoa, Italy, June 21-25, 2010. J. W. Jiang, S. Zhang, M. Chen, and M. Chiang, "Minimizing Streaming Delay in Homogeneous Peer-to-Peer Networks", Proceedings of 2010 IEEE International Symposium on Information Theory (ISIT 2010), Austin, TX, USA, June 13-18, 2010. M. Chen, S. Liew, Z. Shao, and C. Kai, "Markov Approximation for Combinatorial Network Optimization", Proceedings of IEEE INFOCOM 2010, San Diego, CA, US, March, 2010. Y. Li, H. Yao, M. Chen, S. Jaggi, and A. Rosen, "RIPPLE Authentication for Network Coding", Proceedings of IEEE INFOCOM 2010, San Diego, CA, US, March, 2010. H. Yao, S. Jaggi, and M. Chen, "Network Coding Tomography for Network Failures", Proceedings of IEEE INFOCOM (mini-conference) 2010, San Diego, CA, US, March, 2010. Z. Shao, M. Chen, A. S. Avestimehr, and S. Li, "Cross-layer Optimization for Wireless Networks with Deterministic Channel", Proceedings of IEEE INFOCOM (mini-conference) 2010, San Diego, CA, US, March, 2010.